Redding is your Passport for Adventure, the place to enjoy California's natural wonders without congestion and without giving up comfort. Come experience a long list of attractions that can be considered the largest or most spectacular in the nation, such as waterfalls, recreation trails, lakes, caverns, mountains, fishing, theaters and last but not least the world renowned Sundial Bridge. 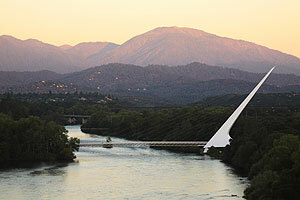 Get more details at www.VisitRedding.com and or call to order an adventure guide at 530-225-4100.